This is a Kangxi period mark of 'Made for the Hall of Gathering Prosperity' (Ju xing tang zhi - 聚興堂製). It is No. 1130 in 'The New & Revised Handbook of Marks on Chinese Ceramics' by Gerald Davison. A rather blurry image of it also is published on Page 118, in the Kangxi Hallmarks Section of 'The Collected Marks on Chinese Historical Porcelains' (Zhongguo Lidai Taoci Kuanzhi Dadian' - 中国历代陶瓷款识大典), 2006 2nd Printing by the Shanghai Cultural Publishing House. 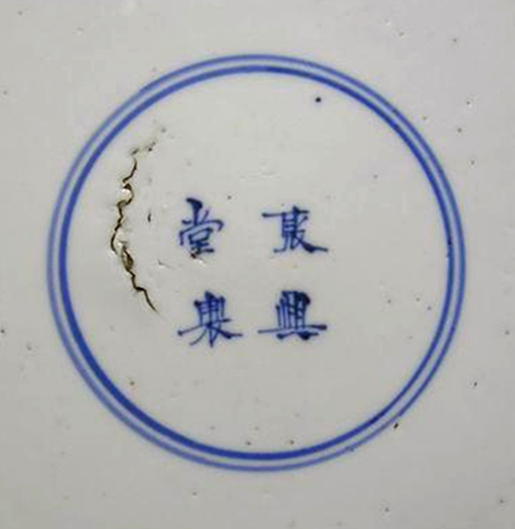 I have uploaded below a cropped screen print of a period marking which was the subject of an intense scrutiny in a December 2007 Chinese porcelain internet forum (Link). The dish in question, a piece from the 'Carrack' trade similar to what is seen here, left some in the forum divided about how the mark should be read. A few disbelievers persisted even after one of the moderators recounted his conversation with an unnamed calligrapher, who'd explained how brush-stroke flourishes that are strange to the modern generation of collectors, were common during the Kangxi period. In any event, the forum image was clear enough to permit me to identify the last three characters of the mark, then to do an asterisk search on Google to ID the first and most "freeform" of the characters. Hopefully, everyone has a machine translation capacity for Chinese Simplified with their web browser, but beware of some of the offbeat results that come about.